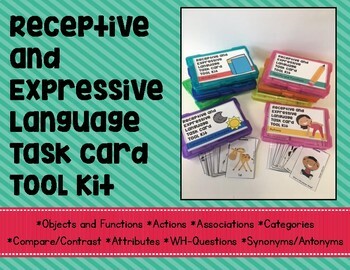 Picture task cards for EIGHT different receptive and expressive language skills!! ALL of the cards with the exception of the divergent naming category cards include pictures for added support! To prepare: Print, laminate, and cut out all task cards. Use the directions on pages 3 through 6 of this product as well as the individual prompts on each set of task cards to target skill areas. I would strongly suggest keeping all sets of cards separate for organizational purposes. Suggestions for how to store the product are included below. To use: Directions on how to use each set of task cards are included on pages 3 through 6 of this product. Prompts are also included on the task cards themselves. To store (suggested): Store cards in 4x6 plastic storage boxes or on a binder ring. There are cover cards on pages 3-6 of this product that can be used to organize all of the cards if you choose to put them in storage boxes..
Want to make activities more challenging for your students? Cover up the supports with a post-it note. For example, cover up the questions on the attributes cards and the three picture choices on the wh-question cards. 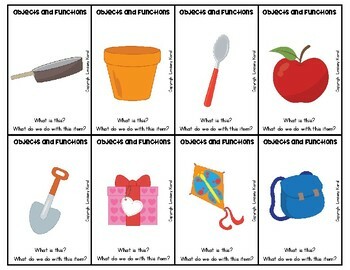 Objects and Functions: There are 72 “objects and functions” task cards included in this section of the product. Students should label the item and then state what we do with the item or what the item does. 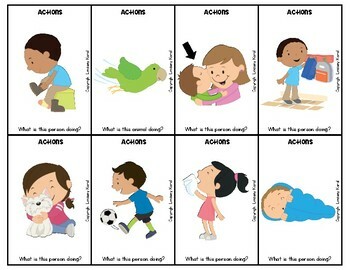 Actions: There are 72 “actions” task cards included in this section of the product. Students should label the action. You can also make the activity more challenging by encouraging the student to make a sentence with the targeted action word. Associations: There are 48 “associations” task cards included in this section of the product. Spread a small amount of cards out at a time. Then, have students find two cards that go together and have them explain how the two pictures are associated with one another. Categories: There are 16 “convergent naming categories” and 32 “divergent naming categories” task cards included in this section of the product. Convergent naming category activity – Label all items on the card. Then state the group or category that all of the items belong to. Divergent naming category activity – Read the category to your students. Have them name items in that category. Compare and Contrast: There are 32 “compare and contrast” task cards included in this section of the product. Students should label the items on the card. Then, they should state how the items are the same as one another and how they are different from one another. Attributes: There are 36 “attributes” task cards included in this section of the product. Students should label the item on the card. Then, they can answer the questions on the left side of the card to describe the object. WH-Questions: There are 120 “wh-questions” task cards included in this section of the product. Each question has 3 picture choices to select from to answer the question. Students should listen to the question and look at the pictures to answer the question. Students can point to the correct answer or verbally answer the question. 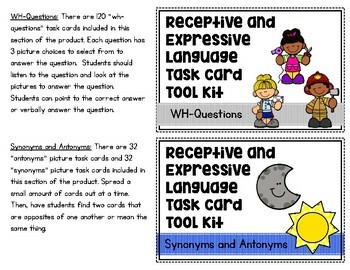 Synonyms and Antonyms: There are 32 “antonyms” picture task cards and 32 “synonyms” picture task cards included in this section of the product. Spread a small amount of cards out at a time. Then, have students find two cards that are opposites of one another or mean the same thing.